Maps are used for a wide variety of purposes to show something of a place, to tell a story or perhaps even to provide an insight into our imaginations. They can also be used very effectively to augment other works and materials to bring something new to the table. In this example, Pearce and Hermann have created a map that traces the story of Samuel de Champlain’s journeys in New France in the early 17th Century. It’s an example of a literary geography being brought to life through cartography. The layout contains a very stark representation of the area of the St Lawrence River and part of the Great Lakes. The otherwise empty space is then filled with a multitude of small insets containing additional maps which act as stages in the journey. The result is both a fairly flat overall image but which contains depth and detail that one begins to see as they enter and explore the map – just as you might a good story. The map isn’t simply a collection of randomly placed map elements which the reader is somehow expected to piece together. The map itself enhances the story so that the travel and the story in the journal is given a spatial context through arrangement. The map provides an additional actor on the stage to give rise to a richer sense of the story as if Champlain is narrating the story through the map. 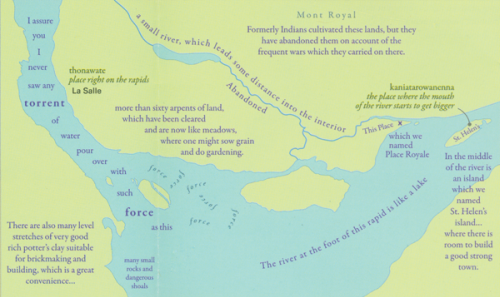 The design incorporates some elements that allow us to see different actors such as the native people’s thoughts and the map author’s comments which make the map an engaging commentary as well as a representation of the original journal. The conversations and incidents are brought alive through the map. Colour is also well played to give rise to an emotional response. Darker colours represents a more foreboding element to reinforce the narrative. 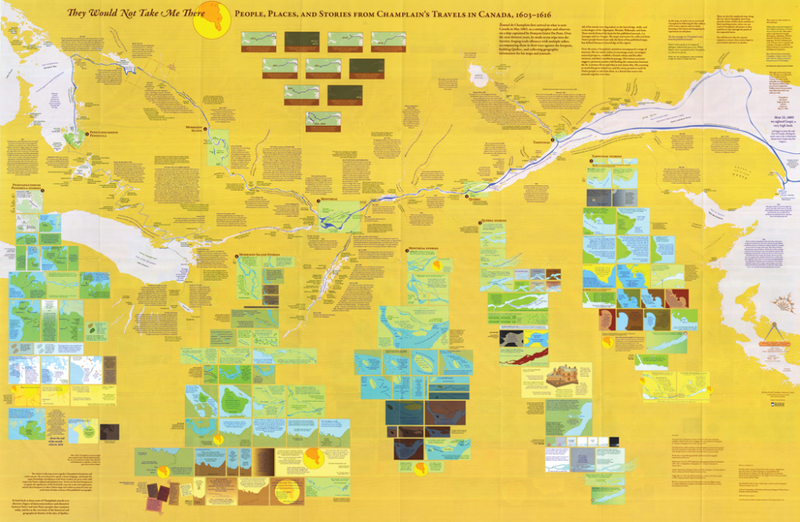 A great example of emotional and narrative cartography; of story telling and of using a map and all the visual stimuli of design to capture the imagination and to convey something more than the journal alone. You can read more about the map from the author’s here and here and Daniel Huffman has written his own excellent critique here. Thanks to Daniel for suggesting this MapCarte entry.